Ménard pressuremeter consists of the BX Ø 58 mm probe and the box supplying – monitoring unit of GC type. Both parts are connected by a concentric cable. Currently “Geoprojekt Szczecin” possesses two pressuremeters: one GC type (Fig 1a) and the new one with electronic recording device GEOSPAD (Fig. 1b). The cylindrical probe consists of three expandable cells. The probe exerts equal pressure on borehole walls through water supplying to measurement cell and gas to two protection cells. Characteristic diameters of BX probe are given below in Table № 1. The probe is placed in substratum at a required depth in pre-drilled borehole of the diameter greater of not more than 15% of the diameter of the probe, i.e. 60 – 66 mm for BX probe. Dry drilling is executed above groundwater table, and slurry drilling with the use of bentonite mud below. Its density is adjusted to the drilled soil. The use of drilling mud protects borehole wall against cavern formation and keeps its constant diameter. In gravels or rubble fill cased drilling is necessary sometimes to prevent bore-hole from filling up. „Geoprojekt Szczecin” drills boreholes with the use of H25S and BIRDIE mechanical drilling rigs. The test is preceded by resetting manometers, filling in the system and measuring its stiffness i.e. determining corrections related to reaction of the device to given pressure to correct test results. Some elements reveal elasticity e.g. cable connecting the probe with monitoring unit. These deformations are measured during calibration for volume losses, which is executed in calibration pipe by increasing pressure by 0,1 MPa till a tight contact with pipe is obtained, and then pressure increments grow to 0,25 or 0,5 MPa. 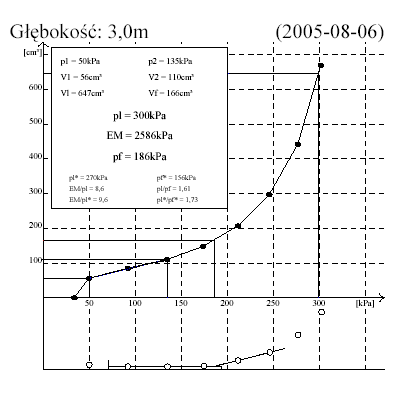 Value of correction a = ΔV/Δp is obtained from the ratio of volume increment (V) measured with volume of liquid pumped into the probe to the increase of pressure ( Δp; Fig. 2). Shields of the probe have their own stiffness which is determined by calibration for pressure losses. This calibration is executed by putting the probe at surface level and adjusting the pressure by 0,01, 0,02 or 0,025 MPa steps kept for 60 s, noting the volume of chamber after that time. 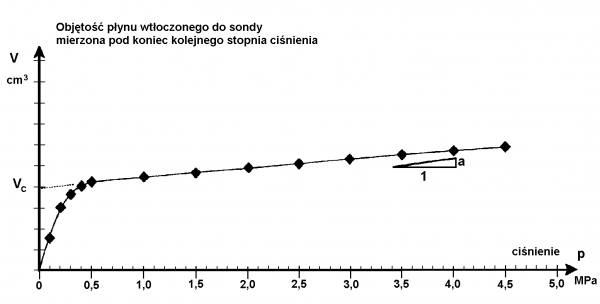 Pressure is increased to boundary value of stiffness which is conventionally adopt as pel = 700 cm3 (Fig. 3). After calibrations, the results of which are considered during interpretation, the probe is placed into the borehole at a required depth and media are supplied through pressure cable connecting supplying – monitoring unit with the probe. 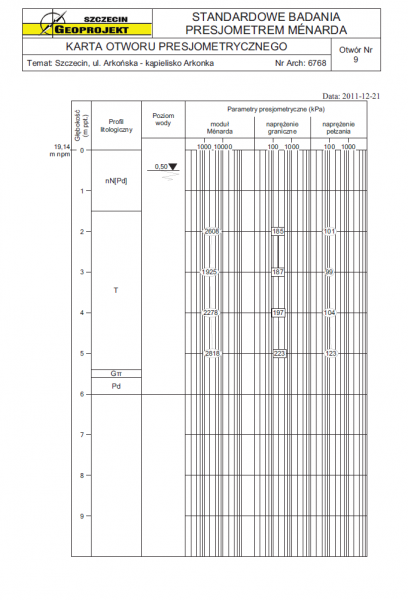 Pressure steps of 0,2; 0,5; 1,0 or 2,0 at are most commonly used depending on the type of the soil tested. The number of increments varies from 7 to 16. Changes in volume of the probe are measured then. Numerical data are read from manometers and view-finder tube and written down manually or, on request, with an equipment allowing their automatic recording (SPAD). creep and plastic deformation phase, again characterized by a quick volume growth. Shape and range of particular sections of the curve depends on the kind of soil. Corrected (by calibrations) results are interpreted following the French Standard NF P 94-110-1-N with the use of PRESJOMETR 2.0. software (Fig. 4a, 4b). The interpreted parameters are: pressuremeter modulus EM , pressuremeter limit pressure pl and creep pressure pf . Pressuremeter is used for obtaining both basic soil parameters and parameters used directly for building design. Results of pressuremeter test gives the information about two most important soil parameters for designing purposes: soil strength (bearing capacity) and compressibility. Test allows to evaluate limit and permissible bearing capacity and also settlement. AFNOR 1999-10-07 NF P 94-110-1-N Norme française. Sols: reconnaissance et essais. (French standard. Soil: reconnaissance and testing. Ménard pressuremeter tests.